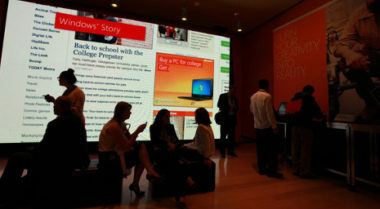 At the 2012 Advertising Week held in New York City, the focus was on how digital, social media, and mobile channels have become the advertising industry’s primary methods of promoting products and services today. The event featured more than 150 panels and presentations from industry experts that emphasized the importance of these digital marketing methods. Topics of these talks highlighted how popular social media platforms like Twitter, Facebook, Pinterest, Tumblr, and Instagram had redefined the modern marketing and media landscapes and were presenting opportunities to reach and resonate with consumers like never before. The New York Times reported on the high-tech highlights of this major marketing meeting. Facebook drew attention at the conference by leveraging the opportunity to promote the benefits of buying advertising on the social media site. The company has been striving to evolve the public’s perception of the platform from a social media network into a major branded advertising medium similar to television. The company displayed recent research that demonstrated its efficacy and value for brands in an effort to show advertisers that successful social media advertising was determined by much more than counting clicks. A main topic of conversation at the conference was the relationships built between brands and consumers via social media. According to Twitter, 90 percent of its members followed at least one brand. While most said they followed a brand for special promotions, 87 percent followed for personal enjoyment, and 80 percent followed for exclusive branded content. Since social media channels like Twitter provide brands with direct means of communication with consumers, they often deliver valuable feedback that can greatly improve a brand. In fact, some of these conversations have even inspired a brand’s concepts for its TV advertising campaigns. Throughout the conference, it was clear that marketers have finally realized the power and potential of interactive advertising. As a result, these popular platforms have responded to the growing demand, with advanced advertising services and innovative digital marketing tools. These offerings have all been designed to help brands better connect with consumers while allowing these digital channels to evolve into major marketing and media machines. To learn more about the latest trends in digital marketing, contact MDG Advertising today at 561-338-7797, or visit mdgadvertising.com. MDG Advertising, a full-service Florida advertising firm with offices in Boca Raton and New York, NY, specializes in developing targeted Internet marketing solutions, exceptional creative executions and solid branding and media buying strategies that give clients a competitive advantage. Our core capabilities include branding, logo design, creative, digital marketing, print advertising, mobile marketing, media planning and buying, TV and radio, Web design and development, content marketing, social media marketing, and search engine optimization (SEO).